Welcome to the January 2019 newsletter of Let’s Move in Libraries. This edition highlights: a) how libraries got us moving on New Year’s Eve, b) stories of libraries trying new things, and c) updates on ongoing Let’s Move in Libraries projects. 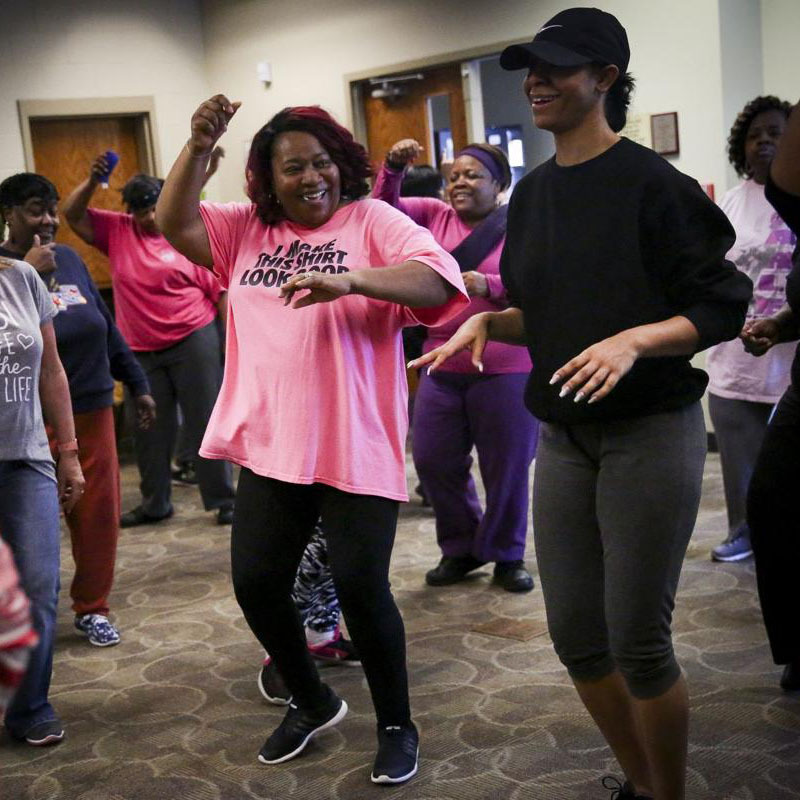 “Come on, girl!” Melva Anderson shouts to her cousin, Brittany White, of Portsmouth, Va., during a beginners line dancing class led by Linda Gray at Churchland Library in Portsmouth, Va., on Saturday, January 5, 2019. Photo via The Virginian Pilot. Once again, public libraries throughout North America (and beyond) celebrated New Year’s Eve by having family-friendly dance parties. Let’s Move in Libraries kept track of these celebrations as they folded. Check out these lovely photographs and news stories about library dance parties in Bristol, Connecticut; Skokie, Illinois; New York; Grove City, Pennsylvania; Calgary’s New Central Library; Anchorage, Alaska; Kearney, Nebraska, Amherst, Massachusetts; and so many more! Did you organize a dance party at your library to celebrate the New Year? Let us know! We also wrote a story about how libraries in the United Kingdom are stepping up with special programs in the New Year to help people live more actively. Are you trying anything new this year at your library? Share with us! I would love to start garden boxes on the library property. We will use some of the links given for health data in our county and state. We saw lots of grant ideas that would really help our community. We are embarking on a Health Literacy grant project, so this is very timely. It’s wonderful to know that I’m not alone!! The process alone was great. Assess, find partners, plan, evaluate. There were some partners I had not thought of before. Everything was explained very clearly and well. If you missed the webinar, you can watch it online whenever you want. Also, check out our Events page for recordings of other past webinars we’ve done. In other news, we are thrilled to share that Advisory Board member (and New Brunswick library director) Jenn Carson’s new book is now available for pre-order! Yoga and Meditation at the Library: A Practical Guide for Librarians contains step-by-step instructions about how to infuse Yoga and meditation into your library spaces, programs, and collections. Our research found that Yoga is the most commonly offered type of movement-based program in North American libraries. Whether you already offer some Yoga and want to enhance what you already do, or if you want to try Yoga at the library for the first time, this new book should definitely be checked out! Finally, our work with the National Institute on Aging’s Go4Life campaign continues very strong! In our February 2019 newsletter we will be asking for information from libraries that offer physical activity programs targeted in whole or in part at older adults. We will then use that information to inform the next steps of this collaboration! We also want to thank Go4Life for putting us in contact with Geri-Fit: Strength Training Workout that Work. With that connection, a study of using Geri-Fit for chair-based exercise classes in older adults is beginning this January in over 60 public libraries across the U.S.! Stay tuned for updates on this exciting new initiative!